Foaming fountain nozzles mix air with the pumped water, creating a frothing 'champagne' effect which looks particularly attractive when illuminated. The foamy water jet is also effective at aerating a pond or lake, assisting in putting vital oxygen back into the water. Foaming Nozzles are available in 3 sizes to suit small water features or larger commercial fountain projects. Foaming fountain display heights of up to 5 metres can be reached. 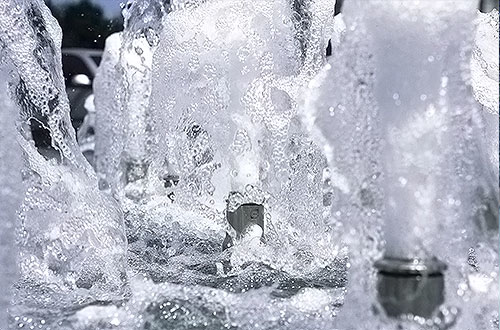 Foaming Jet nozzles are generally featured in modern or contemporary water feature designs. They deliver a thick plume of dense bubbles which creates a gentle rolling impact upon return to the water's surface. A common design for these which has been used over the last 5 years is a long narrow open pool of water featuring foaming jets sited out evenly across the centre line to create symmetry. 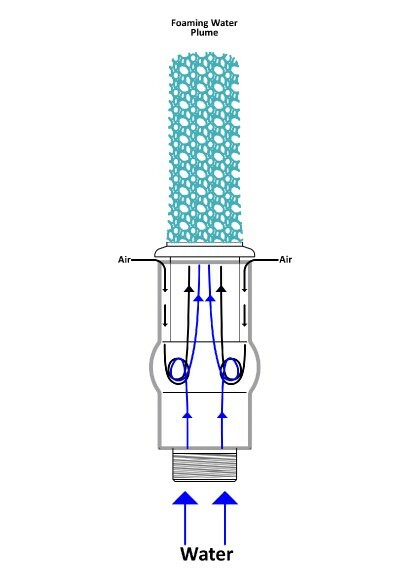 These nozzles function by drawing in air through a venturi opening at the top of the nozzle. This air is drawn into the body of the nozzle and aggressively mixed with the water being pumped into it. This high air to water ratio creates a frothy white water which erupts from the tip of the nozzle, comparable to an uncorked Champagne bottle. The effect is resilient to wind and provides excellent aeration levels.